One of the questions to the RPG panel was how much the particular game rules mattered to what kind of campaign the referee wants to run. For example, for a story-based campaign do you need a story-based role-playing game? I said any game could be adapted for any campaign, but another panelist, Sarah Newton of Cubicle 7, disagreed, and I can see why. The extreme version of story-based RPGs, something that appears to be more and more popular and which Fate could easily be used for, is the cinematic campaign. In such campaigns it would be quite normal for characters to take actions that one might see in tentpole adventure movies. The best example I can think of is Indy’s survival of a nuclear blast because he hides inside a refrigerator. The force of the blast that launched the refrigerator Lord-knows-how-far would have killed him, the shock when it hit the ground would’ve killed him, and there’s no way it could have stayed closed during the “flight” and yet open easily after coming to rest. But in a movie we just kind of accept it and move on, because we knew it was going to be fantastical before we went to it. Yes, there are lots of people who would never bother with an Indiana Jones movie because they know it’s fundamentally nonsensical, but also lots who ignore the silliness of it and love to watch. TV programs like Lost routinely also veer into the land of unbelievability. Don’t get me wrong, fantasy can be quite believable if you begin with the assumption that magic exists; I’m talking about events that occur in a story that are so astronomically unlikely that they’re unbelievable no matter what the technological/magic parameters of the setting. Teenagers often play fantastical RPGs, which I have tended to call “brain fever”. Whatever you could hatch in your feverous brain, the referee might go along with! In a cinematic RPG the players would argue about how wonderful their character was in this nuclear refrigerator situation and persuade the referee to give them some chance to survive. While in reality the chance is ridiculously astronomical (if I even bothered I’d say “role 10 d10s and if you get a 10 on all of them you survive but are so badly hurt you’re unable to move”), more typically the referee will give a significant though small chance such as 1 in 100 or even 1 in 20. Players might argue that their RPG characters are much tougher than a normal person (Indiana Jones is far tougher than a normal person, but not a superhero). Because of that “magical” toughness their character should be able to survive in the refrigerator. It doesn’t really matter that the refrigerator itself would be unlikely to survive. . . Sure. As you can see from my example, I would not be a suitable referee for a cinematic RPG. The ridiculousness of what was going on would offend me, and if I bothered to give any chances at all they would be truly astronomical. But some of that may come because I treat D&D (the only RPG I play) as a kind of cooperative wargame, not as a storytelling engine. The cinematic D&Ders are clearly playing for story, not for gameplay. Games like Fate remind me of one well-known wargamer’s view of RPGs: he feels they are too “loosey-goosey”, he wants to know what he can and cannot do. Games like Fate are much more like miniatures rules, which seem to require constant negotiation anyway (as another well-known wargamer said), than like boardgame rules which are supposed to define all possibilities. I think a cinematic RPG will work better if it's less precise, if more comes from the players and less from the referee, and less yet from the rules. Or as they say in “Pirates of the Caribbean,” the rules are actually more like guidelines . . . I think part of the unbelievable cinematic play derives from a widespread failure to understand probability and large numbers. To most people one large number is as good as another even if one is 10,000 times more than the other. They don’t seem to understand that 1 in 100 is immensely different from 1 in a million (or even 1 in a thousand), which is in turn immensely different from 1 in a billion. And your average person has no clue about probabilities. But a bigger part probably may come from what I see as the great increase in game-playing as escapism in the form of wish-fulfillment. Players don’t want to be limited, they want to get away from reality, the want to feel powerful and heroic, so a cinematic game can suit their feelings and purposes. Wargames require mental (not physical) concentration, movies don’t. (In contrast many computer games require physical concentration, except even if you die you just respawn or go back to a save . 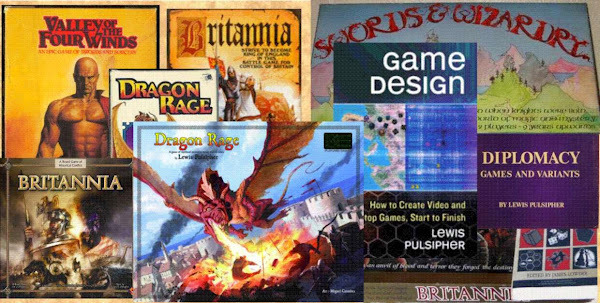 . .) Wargame-style tabletop RPGs inevitably will become less popular over time, while story-style will become more popular, as people tend with passing generations to concentrate less on a particular thing. It’s a trend seen in TV, the theater, and computer games as well as many other parts of life, so why wouldn’t it affect RPGs as well? If the story style of play takes direction from the players and the rules, rather than depending heavily on the referee, then it’s as practical as the wargame style. In fact, for the wargame style the referee needs to master many rule details, while the story style can be much less precise, and that may appeal to many referees. To go back to the Expo, I was looking at Cubicle 7s 600+ page large-format hardcover books. Why, I asked myself, would younger people especially, who normally don’t read books, buy such enormous tomes? I asked Sarah about the demographics of Cubicle 7's market, and she answered 25 to 40 years old. So that includes lots of Gen Xers and the older millennials, perhaps beyond the age of the millennials who are famous for the acronym “tl;dr” (too long; didn’t read). On the other hand, millennials will read a lot when they really get into something, but that kind of enthusiasm is uncommon. The only reason I can think of for good sales is that these books are bought as a substitute for imagination. It is often suggested that young people don’t use their imaginations much because for many, many years now stories have been presented to youngsters whole cloth, with visuals. Their toys are from particular stories, video games have the stories built-in, television and movies are everywhere, and so youngsters have rarely had to figure out stories on their own. They aren’t, for example, presented with the challenge of making paper boats and then figuring out what to do with them. Any boats they have are ready-made and associated with specific stories. So in RPGs they’re much more likely than my generation (boomers) to use something imagined by someone else rather than to imagine it themselves. I’ll interject a related observation here. A few years ago I attended a talk by Monte Cook of D&D fame at the Origins Game Fair. At one point he observed that published D&D adventures spend a lot more time on story than in the past, and wondered why. My answer is that people don’t buy the adventures to play them so much anymore, they buy them to read them, and they want to read a story with a plot rather than just read about a situation. The buyers can then take whatever aspects of the story they like and incorporate them into the stories that they are telling in their own games, and they can also incorporate the game ideas they get into their adventures, but most of the time they don’t use the entire published adventure. There are so many inexpensive published adventures now that few people would have time to use even a small fraction, so they’re often bought to be read, not played.